Kerry Madsen wins FVP Platinum Showdown! 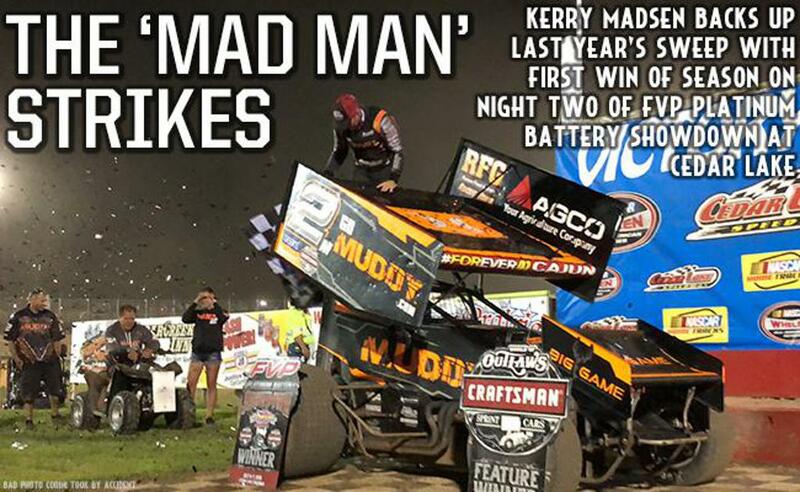 NEW RICHMOND, WI – July 7, 2018 – Kerry Madsen, who swept both nights of last year’s FVP Platinum Battery Showdown at Cedar Lake Speedway, got the monkey off his back with his first World of Outlaws Craftsman Sprint Car Series victory of 2018. In a 41-lap Feature in honor of Jason Johnson’s birthday, Madsen passed Brad Sweet on Lap 38 in an exciting race. Sweet settled for second with Donny Schatz completing the podium. For the second consecutive night, Brad Sweet won the Sears Craftsman Dash, earning the pole for the Feature alongside Jacob Allen. Sweet charged from fifth to second in his Heat Race just to Qualify for the Dash. Sweet led the opening lap utilizing the bottom of the racing surface. Jacob Allen powered around the Grass Valley, CA native to lead Lap 3, in search of his first career Outlaw victory. Allen maintained the lead, while Sweet stayed right with the driver of the Shark Racing No.1A. With 10 laps complete, a yellow for Shane Stewart – who was running in the top five – negated Sweet’s pass to regain the lead. Allen elected the top on the double-file restart and lost the lead to Sweet heading into turn one. Madsen would pull a slide job on Allen to steal second on Lap 17. A lap later the final caution of the evening flew for Justin Henderson, setting up another double-file restart. Sweet maintained control on the restart and continued to lead as he navigated lapped traffic. Madsen, who started sixth, stayed right with Sweet and made a bid to the outside of Sweet for the lead on Lap 36 in turn one, to no avail, as Sweet slid in front of the Australian to maintain the lead down the backstretch. Madsen got another run off the cushion and this time slid in front of the Kasey Kahne Racing No.49 to take the command on Lap 39. Sweet tried to turn back under but was unable to do so as Madsen distanced himself to the checkered flag two circuits later. Madsen would go on to win by .783 seconds over Sweet. Brad Sweet settled for second and referenced lapped traffic after the race, “That’s what wins and loses these races, I got off my line a little bit. We’re running up front every night, it’s just a matter of putting it all together,” Sweet said before giving a shout out to Bobbi and Jaxx Johnson. Donny Schatz started and finished third and applauded the track crew for the work preparing an excellent racing surface. “The race track was good, there were multiple lines on the track, I just couldn’t find any speed. That’s the way it goes some days. It’s time for some big races and we are looking forward to that,” the nine-time Series Champion said next to his Tony Stewart Racing No.15. David Gravel earned KSE Hard Charger honors coming from 10th to finish fourth. The best race of the evening was for fifth as Dominic Scelzi, Cory Eliason and Sheldon Haudenschild swapped the position seemingly every lap with Scelzi claiming it at the checkered flag. The World of Outlaws Craftsman Sprint Car Series continues the Month of Money and its 40th Anniversary Season Tuesday, July 10 at Attica Raceway Park with the Brad Doty Classic before heading to Eldora Speedway for the three-day Kings Royal weekend, that will pay $50,000 to the winner on Saturday evening.